This Wheel has been used previously, in full working order but it has some minor cosmetic damage. As shown in the picture's. This Wheelset has been used but show's hardly any signs of it. Light brake surface marks and remainder of Tub Glue, as shown in pictures. 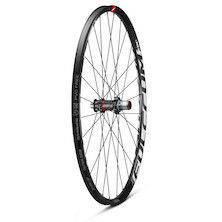 Due to the Freehub on this Wheelset it is compatible with 10 Speed Road Cassette's or 11 Speed MTB Cassette's. 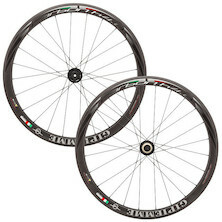 Suitable for Road and Cyclo Cross this wheelset is breathtakingly light at around 1260 grams per pair. 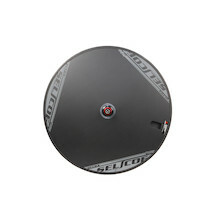 If you are a serious Cyclo Cross rider and opt for carbon wheels then these are perect for the demands of the winter. 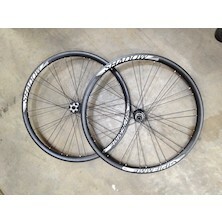 700c Disc brake wheelset with 12mm front and rear thru axles. 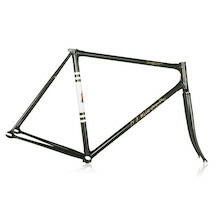 Perfect for a Gravel bike, ideal for CX and just the ticket for your disc brake road bike. This Fork has been used, the steerer has been cut to 16cm and there is a small chip in the paintwork. As shown in the picture's. 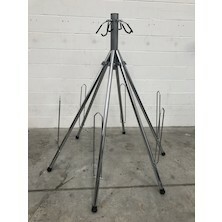 This Seatpost has been sent back to SRAM and they advisd that the seatpost require's a service to be back in full working order. 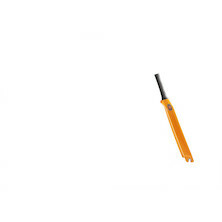 This Fork has been used previously and the steerer has been cut to 22.5cm. It is in great condition but has some minor cosmetic damage, as shown in the picture's. 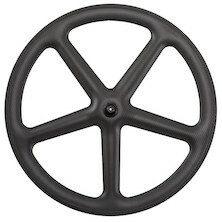 700c tubular tyre track rear disc wheel. Lightly used, insanely fast and ready for a 2nd life. This Fork is brand new but has had the steerer cut to 23cm. 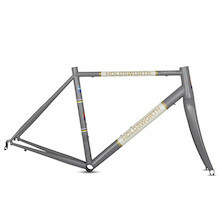 Holdsworth's first full-carbon track fork is simply superb and builds on the success of their UCI approved Super Professional road bike. 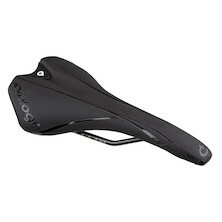 Handmade from a blend of Toray carbon fibre and featruing advanced aero tube profiles it's designed to get you around the boards, fast. This Handlebar is brand new but has a small scratch. As shown in the picture's. This is the Right hand pedal only. 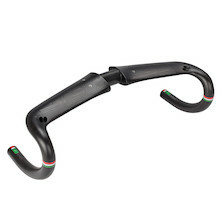 These Handlebar's are brand new but have some minor cosmetic damage, as shown in the picture's. This Fork has been used previously but show's barely any sign's of it. The steerer has been cut to 18cm and there is some minor cosmetic damage, as shown in the picture's. 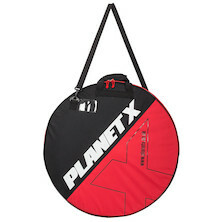 This Wheel Bag has been used previously but is still in full working order. 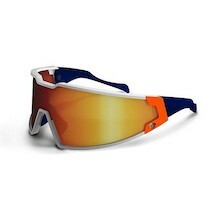 It has some scuff's as shown in the picture's. 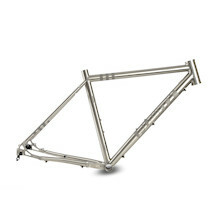 This Frameset is brand new but has a dent in the headtube as shown in the picture's. 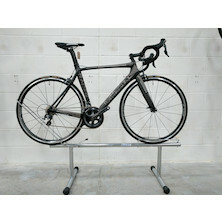 This Frameset is brand new but has some minor cosmetic damage as shown in the picture's. 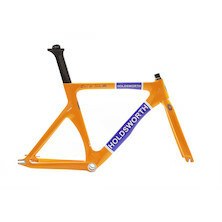 This Frameset has never been used but it has been assembled previously. It has some minor cosmetic damage as shown in the picture's. 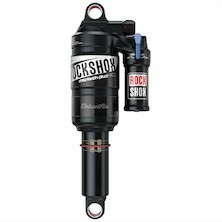 This Rear Shock is brand new but has some minor cosmetic damage, as shown in the picture's. Monarch Plus provides traction-gaining suppleness, giving you more control over any type of terrain all in a lightweight bombproof package. 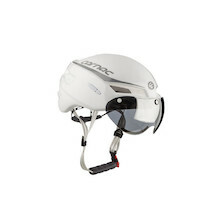 Proven Rapid Recovery, DebonAir and Solo Air technologies come standard for this lightweight big hitter. Now with twice the rebound range, Monarch Plus allows you to take your riding to levels you never thought possible with a short and mid travel air shock. 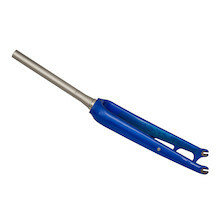 This Fork is brand new but has some minor cosmetic damage as shown in the picture's. These Freehub's have had some light use but are in complete working order and still have the original packaging. As shown in the picture's. 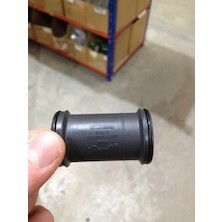 10/11-speed compatible freehub replacement for Campagnolo Bora Wheels. These Handlebar's are brand new but there are some scratches on them, as shown in the picture's. This Front Mech has never been used but it has been fitted to a Bike previously and has some minor cosmetic damage. 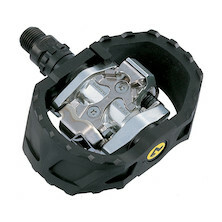 Optimised Shimano 11-speed - the FD-6800 has a new pull arm design for easier shifting and improved performance. This Frameset is brand new but has a slight dent on the headtube and a little bit of paint damage. As shown in the picture's. 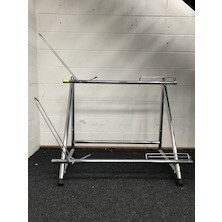 This Fork has been used but is in great condition the steerer has been cut to 18.5cm and their is some minor cosmetic damage as shown in the picture's. 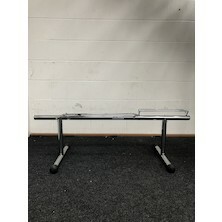 This Fork has been used but is in great condition the steerer has been cut to 19cm and their is some minor cosmetic damage as shown in the picture's. This Fork is brand new but the steerer has been cut to 24cm and it has some minor cosmetic damage, as shown in the picture's. This Rear Wheel is brand new but is slighty out of true by 0.6mm. 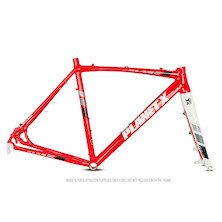 This Frame is brand new but when removing the Frame from the box we realised there was a small paint chip on the bottom bracket, as shown in the picture's. 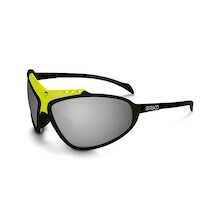 Revised and refined the RT-58 Alloy V2 offers a huge slice of cycling performance for minimal outlay. Revised frame geometry, improved tyre clearance and space for mudguards it makes the perfect endurance bike for the new cyclist and an ideal winter trainer for the serious competitor. These glasses are brand new but are missing the spare lenses. 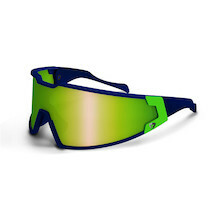 These glasses ahave been used they are in good condition but some of the paint on the frame is flaking off. 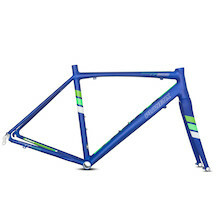 This Frameset is brand new but when starting to assemble the Frame into a Bike we noticed there was a small chip in the paint on the drive side chainstay, as shown in picture's. 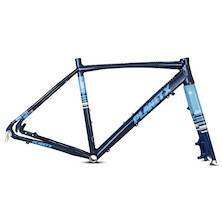 This Frame is brand new but has some minor cosmetic damage, as shown in the pictures. 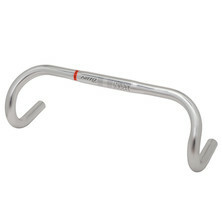 These Handlebars have never been used but they have a rattle coming from inside the bar's when shaken. There is some minor cosmetic damage, as shown in the pictures. 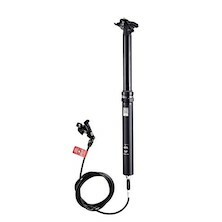 This Seatpost has been used previously but is in great condition, it has some minor cosmetic damage from where is has been pushed into the seattube, as shown in the picture's. 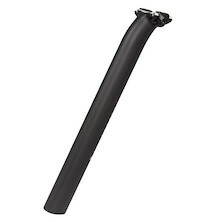 This Seatpost has been used previously but is in great condition. 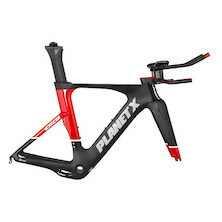 It is missing the saddle rail clamp but would be great for anyone that has damaged their Exo 3 Seatpost. This Fork is brand new but it is missing the Fairing and has some cosmetic damage as shown in the picture's. 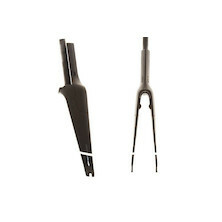 Replacement full carbon fork for your EXO3 TT/Tri bike. 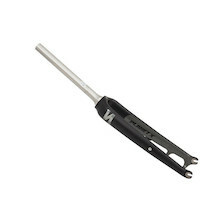 This Fork has been assembled onto a Bike but never used, the steerer has been cut to 16.5cm. It is missing the Fairing and has some cosmetic damage, as shown in the picture's. 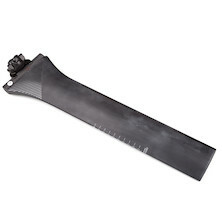 This Fork has been assembled onto a Bike but never used, the steerer has been cut to 14cm. It is missing the Fairing and has some cosmetic damage, as shown in the picture's. 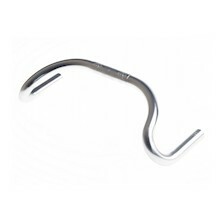 This Handlebar is brand new but has been fitted to bike previously. 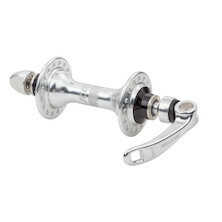 The bars are missing pad's, bolt's and spacer's and there is some cosmetic damage, as shown in the pictures. This Fork is brand new but the steerer tube has been cut down to 140mm and the fairing is not included. 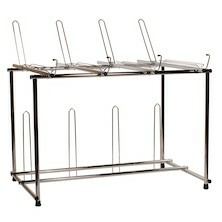 As shown in picture's. This Fork is brand new, when we started to assemble the frameset we noticed that the fairing was a slightly different colour. As shown in pictures. This frameset has very minor paint chips on the underside of the bottom bracket shell. 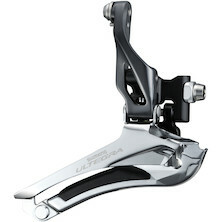 The UItegra groupset shares the same building quality and faultless performance with the ultimate Dura-Ace at a much lower price! This cassette has had some use by the Holdsworth Team.Still plenty of life left in it. This Helmet is brand new but has some minor cosmetic damage and no visor. This Wheel has been used previously but really doesn't show any signs of it.